This is a basic homemade recipe but the secret is in the preparation. 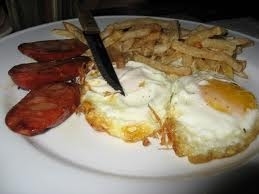 You can fill it with anything that you can think of but here in Galicia we love fried eggs with sausage. Here is a photo of the fabulous recipe that Paco served last Christmas for dinner. Incredible! Cortamos las patatas en rodajas finas y las ponemos a freír con el chorizo cortado en dos o tres trozos. Cuando estén doraditas, retiramos y dejamos escurrir un poco. En el mismo aceite de freir las patatas, freimos los huevos para que lleven todo el gustillo del chorizo. ... y lo más importante, la buena compañía. Cut the potatoes into thin slices and put them to fry in olive oil with the sausage cuted into two or three pieces. When look like golden brown, drain and let you withdraw a little. In the same oil fry the potatoes, fry eggs to give all a taste of the sausage. ... And most importantly, good company.